In the era of information and communication, issues of misinformation and miscommunication are more pressing than ever. Epistemic injustice - one of the most important and ground-breaking subjects to have emerged in philosophy in recent years - refers to those forms of unfair treatment that relate to issues of knowledge, understanding, and participation in communicative practices. Case Studies of Epistemic Injustice. As well as fundamental topics such as testimonial and hermeneutic injustice and epistemic trust, the Handbook includes chapters on important issues such as social and virtue epistemology, objectivity and objectification, implicit bias, and gender and race. Also included are chapters on areas in applied ethics and philosophy, such as law, education, and healthcare. 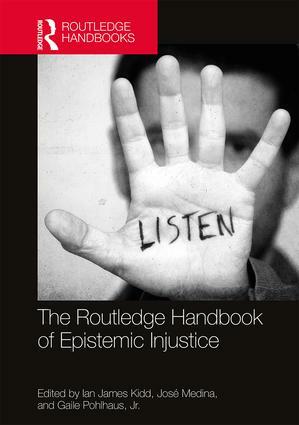 The Routledge Handbook of Epistemic Injustice is essential reading for students and researchers in ethics, epistemology, political philosophy, feminist theory, and philosophy of race. It will also be very useful for those in related fields, such as cultural studies, sociology, education and law. Introduction Ian James Kidd, José Medina, and Gaile Pohlhaus, Jr.
1. Varieties of Epistemic Injustice Gaile Pohlhaus, Jr.
Ian James Kidd is Assistant Professor of Philosophy at the University of Nottingham, UK. With Jonathan Beale he is editor of Wittgenstein and Scientism (Routledge, 2017). José Medina is Professor of Philosophy at Vanderbilt University, USA. He is the author of four books, including The Epistemology of Resistance: Gender and Racial Oppression, Epistemic Injustice, and Resistant Imaginations (2013). Gaile Pohlhaus, Jr. is Associate Professor of Philosophy and affiliate of Women’s, Gender, and Sexuality Studies at Miami University, USA.